“A brushfire Sunday was small enough to be called minor, but early enough in the season to be an ominous taste of what might be ahead. Get Out of Jackson, Wyoming! Back in May of 2011, I sent an email to the Algona Upper Des Moines newspaper. In the email, I told them that I had a book published in 2008 entitled High Plains Drifter: A Hitchhiking Journey Across America. 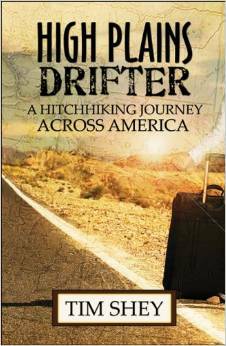 Since I was a native of Algona, I thought that they would want to run a story about my book and hitchhiking travels. There was no response. I was born and raised in Algona, Iowa. I went to grade school, middle school (St. Joe, Iowa) and high school (Bishop Garrigan High School, 1974-1977) in Algona. I was involved in Cub Scouts, little league baseball and 4-H in my youth. I lived most of my first 26 years in Algona or rural Algona. And the Algona Upper Des Moines newspaper had absolutely no interest in my book whatsoever. I find that a bit odd. the practice of hitchhiking legal. introduced by Alta, Wyo., Sen. Leland Christensen. backs of citizens,” said Christensen. But in Idaho, thumbing is still illegal. standing on a highway to solicit a ride. simply someone seeking a ride. the same direction as the deputy they’ll be given a ride. hitchhikers so we can hammer them,” said Liford. Liford said he knows who they are. up by the same people. tend to get picked up here pretty quickly. or a destination at the top. wanted to change the law. I had great support around the state,” he said. national level because of fears people associated with it. And hitchhiking is directly tied to freedom for Shey. “Freedom of movement, freedom to explore,” he said. for a ride. Liford echoes that sentiment. hitchhike out of was Las Vegas back in 2005. The friendliest city by far was Salt Lake City. getting people to pull over? There is probably a psychology to hitchhiking. the floor; I let him off at the next town). end up in jail where you belong. looking for a ride using their thumb? my hitchhiking days are done. Here is an article about pro-abortionist Reverend Mary Erickson of the St. John’s Episcopal Church in Jackson, Wyoming. Mary Erickson is one of the more prominent Baal Worshipers in Jackson. Faced with a perceived threat, Reverend Mary Erickson was compelled to act. As a mother of two kids, she felt immediate maternal instincts to protect impressionable children from the graphic imagery used by anti-abortionists which included militant members of Operation Save America. Her day job as an assistant priest at St. John’s Episcopal Church had given her the experience she needed to rally others, to organize the fears and aspirations of a group and direct them for good. Her vocation taught her hate is always fought best with love. Jackson Hole United was formed in the face of the second coming of right-to-life protesters, including Pastor Mark Holick and his church along with OSA volunteers. Intimidated by a recent State Supreme Court ruling in the pro-lifers’ favor, Town of Jackson officials allowed their special events permit with some restrictions. It was obvious someone needed to step in and step up. It was Erickson, and others, who answered the call and provided Jacksonites with a quiet leadership that brought cohesiveness to a fractured community. When OSA brought its repugnant revival to the town square during Elk Fest, its shock-and-awe campaign was met with civility, compassion, and love. Red-shirted proponents of fire and brimstone were calmed by the soothing ‘blue’ band of tight-knit locals who refused to let their town be hijacked. It was inconceivable that any one person or group could unite such a disparate clutch of citizens, yet here were 2,297 believers dedicated to a movement bigger than Facebook, each ready to pledge an allegiance to their kids and their community. And the good reverend tended her flock with grace. Still, Erickson acknowledged any inclusive group was going to have its own internal strife. There would be divisiveness. There had to be. JHU is made up of pro-lifers, pro-choicers, political lefts and rights, religious followers and the secular-minded. Each JHU member brought his or her own beliefs and baggage, and that was OK as long as members remembered the golden rule. When their emotions ran raw, when fear and hatred provoked rash rhetoric, they needed to be coaxed back on the path. Erickson admitted she continues to be somewhat surprised by how quickly the group came together and how it has now grown bigger than the issue it was born of. 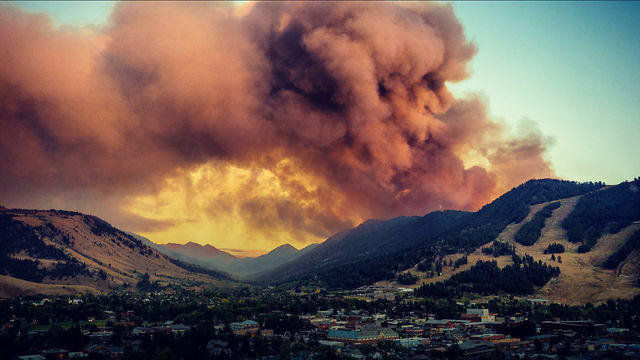 During the wildfire that threatened Jackson, anger occasionally surfaced again, nearly unraveling the threads of community. Some JHU members took up refuge in their safe place. The recent school shooting at Sandy Hook was another example of how horrid the world can be and once again a pacificator was needed to pilot our disquiet into calmer waters. Erickson, a gifted writer, penned an eloquent piece on the JHU Facebook page. “I’ve had a lot of people tell me that [JHU] has continued to be a reminder for them to try to get back to that place of understanding and compassion for one another,” Erickson says. “The fact that this group has continued to grow shows the need in this world today for all of us to find a way to move back to a civil place when we are hurt or our emotions run high. If we can do that as a community then maybe we can have an effect globally. CHEYENNE [19 December 2012] — Tim Shey has hitchhiked across Wyoming dozens of times. The former Jackson resident says it’s a useful way to meet new people, share his Christian faith with fellow travelers and easily find employment. But by doing so, Shey and many travelers like himself have broken the law, since hitchhiking is illegal in Wyoming. A state lawmaker is now trying to change that by introducing legislation to legalize hitchhiking in the state. Sen. Leland Christensen, R-Alta, is sponsoring Senate File 29, which will be considered during the upcoming legislative session that begins Jan. 8. Christensen, who spent 20 years as a deputy with the Teton County Sheriff’s Office, said the current law is doing little good. He said many people are surprised to find out that Wyoming prohibits hitchhiking. Christensen added that during his experience as a deputy, the law was rarely enforced. If it was enforced, he said it was not enforced consistently. Sgt. Stephen Townsend, a spokesman for the Wyoming Highway Patrol, said the state has issued 21 citations for hitchhiking so far this year. He added the Wyoming Highway Patrol has no comment, as of now, on the proposed law change. Shey, who hitchhiked from Jackson to California a couple months ago, has written two self-published books about his hitchhiking travels. He said Wyoming is one of only a handful of states that ban the practice. In the more than 30 years he has been hitchhiking, he said he has only been cited once. And that one time was in Wyoming. He added that hitchhiking is much safer than most people realize. Christensen agreed that many people have misconceptions about hitchhiking from horror movies or urban legends. He said hitchhiking is relatively safe for the driver and the hitchhiker. “There seems to be a lot of people across the country who have faith in it,” he said. “Anytime you are mixing pedestrians with traffic, there will be some risk, but that goes the same today for riding a bicycle or walking. Christensen added that the state law would still prohibit people from panhandling or soliciting employment or business from vehicles on a highway. Shey said repealing the hitchhiking ban could make the state more appealing to travelers. He said the state is already attractive to hitchhikers who want to visit Teton Pass, Yellowstone or are just passing through on journeys east or west. Why is Hitchhiking Illegal in Wyoming?